When I joined the State President's Guard way back in 1968 I was a raw recruit, just turned 17 and never been away from home. For most of the boys recruited back then it was the same, most of us straight out of school, onto a train to the north and into the army. On arrival at Pretoria station we were rounded up by the army who were waiting for us and who herded us into the back of the waiting army Bedford trucks. What a welcome we got. As we climbed off the train the Corporals who had been sent to fetch us yelled at us and insulted us and turned our lives into hell. The ride from the station to the army camp was no different. At every point on the trip where the driver could he braked harder than he should so that everybody in the back of the truck flew towards the front and landed in a heap on top of one another. On pulling away the exact opposite also happened. The army had a special name for it. It was their “ roofie ride” “Roofie” in this context is a small scab. On arrival in the army camp we were ordered off the trucks and were marched straight into the barber shop. Anybody who had long hair got a number one cut and when they came out looked like a shorn sheep. Some of us knew each other but after the haircuts it took us a while to recognise each other. From the barber shop we went straight to the stores to be issued blankets and bedding and overalls and a large “trommel” ( metal box with a lid). This thing was so heavy that I was unable to pick it up. I had to make several trips to the stores to get all my goodies moved to the barracks where we were to be housed. We were given an hour or so to settle in and then had to be ready for an inspection. No one knew how to prepare for an inspection so when the instructors arrived our beds were flipped over and things thrown around to make things difficult for us. To make matters worse, the mattresses were made of coir and were hard and out of shape. We were expected to square them off, a task that was totally impossible. After a couple of days in the camp we were visited by different divisions of the army and offered various opportunities such as cook, military policeman or State President guards. I volunteered to become a State President guard and that was the last time I ever volounteered for anything. To get to the SP guard camp those who had volunteered were marched about two kilometres down a busy road carrying all ones possessions (I had plenty of goodies from home to carry) and eventually arrive there totally exhausted. The best part of this new camp was the bed, it had a SPONGE mattress! We found out that we were the second intake of SP Guards and that the first intake were out at the shooting range for the day. At about 5.00 pm they arrived back and as they exited their trucks and were dismissed for the day they fixed bayonets and charged into camp straight at us moving their bayonets aside at the last moment. I have never been so scared in all my life. Life in the camp soon became routine, learning to march and take commands each morning, lectures in the afternoon, and in the evenings doing your daily chores such as preparing for inspections. When parades were scheduled extra practices were arranged and we had to learn to slow march for funerals, quick march for parades and worst of all to work as one man. We spent most of our timing running to the top of a hill two kilometres away to punish us for our poor drilling. When we began our training when we halted, it sounded like a machine gun but soon a halt became one man stamping his foot. Of course the group did not play ball with the instructors and drove them to despair, especially when we were training for an important parade. We just refused to work together and looked like a bunch of beginners. Before one parade we were drilled for a number of hours to get us into shape and the whole time were plain awful, not listening to commands, turning left when instructed to go right and generally giving the instructor hell. When we arrived at the venue for the parade in our ceremonial dress we had the Captain who was leading the parade in such a tizz that he gave us the halt command on the wrong foot. The regiment came to a halt as one man and after that gave the best parade we had ever done. 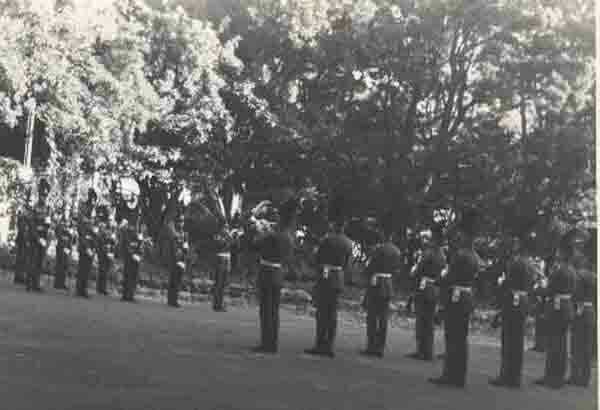 Other than parades we also stood guard in our ceremonial uniforms outside the President's residence at Groote Schuur in Cape Town and in Pretoria. In Cape Town the guard houses where we stood were in the middle of a large garden filled with oak trees. At night it was very eerie standing in the dark with squirrels scurrelling through the branches above your head. One or two guards lost their nerve and bolted for the guardhouse before their stint of guard duty was complete. Our beat was outside the front door of the SP's residence and we were normally warned when the SP was going to make an appearance. On occasion the SP would go for a stroll without warning us and we would land up in mid beat having to present arms. He thought it was fun and would smile and acknowledge us and continue on his way. Of course we were in a state of shock for minutes afterwards. The SP guards were also trained infantry men and in later years did their stint of border duties. After spending eleven months in training we finally handed over our duties to the next intake and left for home. It was so strange to arrive home and sleep in a bed with coloured blankets, and the best of all was being able to wear civvies. Unfortunately today our young men miss out on army training as the compulsory draft has been discontinued. All I know is that the army made a man out of me and could do the same for the young men today.